The rod and reel combo we recommend for cod should be capable of handling 50lb braid. The rod should be 6’6″-7’6″ with a fast to extra-fast action. We prefer a rod that has a little more beef to the rod to handle big diamond jigs and large sinkers up to 20oz. The reel should have at least a 5:1 ratio. Levelwind reels are certainly easier to use, but may present a handicap when dropping the bait down in fast currents (because the line goes out more slowly). Do not be confused by the suggested lure weights specified on the rod blanks. These weights pertain to the size of lures that can be cast effectively using that rod. The reel should be loaded with 50lb braid. The heavier braid is preferred when fishing bouncing sinkers up to 16oz on the bottom. Since braided lines have a thinner diameter and less water resistance, they provide an added advantage and allow the angler to hold bottom with lighter sinkers. The lack of stretch transmits even the softest of hits back to the angler. The basic cod bait rig consists of a 4ft length of 80lb fluorocarbon leader attached to the main line via a 100lb barrel swivel. The rig has one dropper loop 12 inches above the sinker and a second loop 24 inches above the first. Dropper loops stand out 3-4 inches. Each dropper loop is tipped with a 5/0 beak baitholder holder hook. The entire rig is attached to the main line with a 100lb barrel swivel and completed with a sinker ranging from 6-20oz depending on the speed of the drift. On most party boats (head boats) there is a “two hook only rule” and anglers can use no more than two hooks at any time except for a diamond jig which can have a hook on both the top and bottom. A cod diamond jig rig consists of a 4ft length of the 50-80lb fluorocarbon leader attached to a 4oz or larger hammered chrome diamond jig. The rig should be attached to the main line with a 100lb barrel swivel. The best jigs have the highest width to length ratios. These “flatter” jigs have a much better fluttering action. An artificial scented soft-bait teaser on a 7/0 baitholder hook can be added three feet above the jig. There are a variety of colors and shapes that can be used to match the bait in the area which includes mackerel, herring, sand eels, and squid. Georges Bank and Stellwagen Bank both have cod year round. Only on very rare occasions, when the water gets extremely cold does the bite slow. The run to the edge of Georges bank from Hyannis is a least 50 miles and is usually accessible only by larger boats or when the conditions are just right. The shot to Stellwagen is much easier and is less than 20 miles from Boston Harbor. When spawning in the late Fall on Georges Bank, the cod can be found a little closer (and shallower) on some of the many wrecks that litter the bottom. The combination of strong tidal currents and wind can sometimes create some daunting seas. 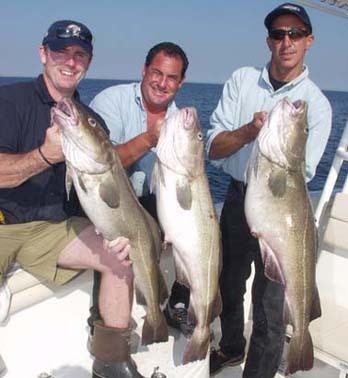 In early winter through late winter there can be a very respectable run of fish that can be reached from Rhode Island and Montauk, Long Island. 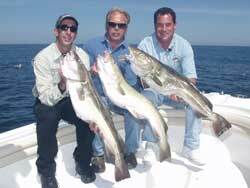 For most anglers, open boats and charters are the best way to experience this fishery. The right piece of bottom can make all the difference. Most captains carefully guard their most productive spots. Rather than take a long ride, burn a lot of fuel, and spend the day trying to find a good piece of bottom, it is both easier and usually less expensive to go on an open boat or book a charter. These captains spend a lot of time in this area and have a very good handle on where the fish are at certain times during the season. Their knowledge of the tides and currents is invaluable. Anglers should bring a cooler and several layers of warm clothes even during the summer months. Cod fishing can get very messy and the decks need to be washed down frequently. Deck boots and skins are a must. All the boats supply tackle if you need it. If you bring your own be sure to leave your light tackle home. For years many anglers used long heavy cod sticks to handle the weight, provide enough length to work their jigs effectively, and much needed hook setting power. Those days are gone. The new braided lines have a thinner diameter and much less water resistance. The lack of stretch allows the angler to feel every bite and provides for an excellent hook sets regardless of the depth. Sinkers and diamond jigs weighing from 14-20 ounces are usually required when cod fishing. Even though the fish are often found in shallower water during the cold winter months, be prepared to fish some very significant depths. 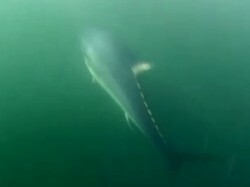 It is not unusual to be fishing in 200-300ft of water. Reels with very high gear ratios (fast retrieves) are required. 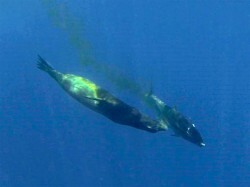 When fishing baits at these depths the amount of time and effort needed to retrieve and re-bait a rig must be minimized. A reel with a very high ratio of retrieve will certainly be more productive. 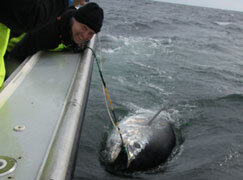 When fishing bait or jigs it is critical to maintain contact with the bottom. More weight must be used as the speed of the drift and/or the depth increase. 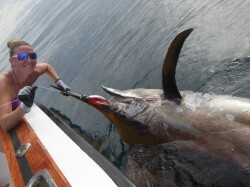 As the rig is lifted off the bottom and the scope of the line is increased, the angler must pay out additional line until the rig hits the bottom. This can usually be done a few times until the water resistance from the amount of line makes it impossible to get down to the bottom. The rig must be retrieved and flipped out again just slightly up-current.